You could be forgiven for having a negative “Oh god, no, anime!” response to the thumbnail image for this review of Blue Reflection. 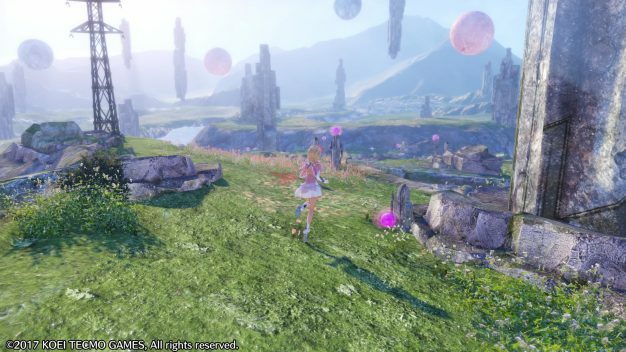 However, with developer Gust – of Atelier, Ar Tonelico, and Mana Khemia series fame – behind the wheel of Blue Reflection, the visuals aren’t all that surprising. Gust specializes in very Japanese fantasy RPGs, and in more recent years have really, really pushed the cute and beautiful girl angle. In fact, Blue Reflection is part of Gust’s “Beautiful Girls Festival” project, which focuses on the portrayal of youth for women, and in particular their interactions with other women and personal growth through sharing experiences with others. 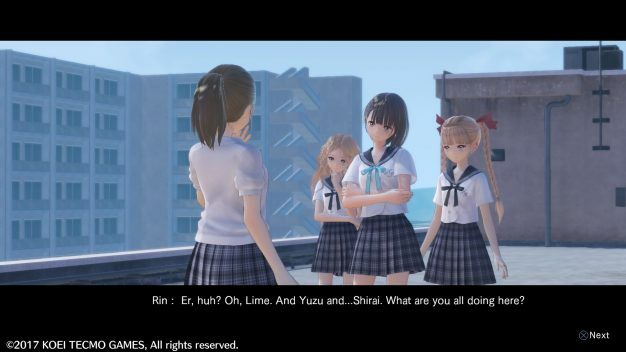 Blue Reflection really embodies all of these key elements, with the majority of its gameplay concerning your burgeoning relationships with your classmates. In Blue Reflection, you assume the role of Hinako Shirai, a high school girl who was, until recently, an accomplished ballet dancer. Originally assigned to the special class at Hoshinomiya High School, Hinako begins the year in the less important regular class after an unexplained knee injury leaves her unable to do ballet ever again. With the help of two strange students, Yuzuki and Lime (yes, Lime) Shijou, she is introduced to her magical girl power and becomes a Reflector. Reflectors travel to the Common, a culmination of society’s emotions, and defeat strange alien and robot-like monsters in order to obtain Fragments. Fragments are left behind in a crystallized form when the Reflectors enter a part of the Common which has manifested due to an overwhelming emotion being experienced by someone they know. For example, Hinako met with a middle school acquaintance who became overwhelmed with the idea that they could finally be friends in the same class. 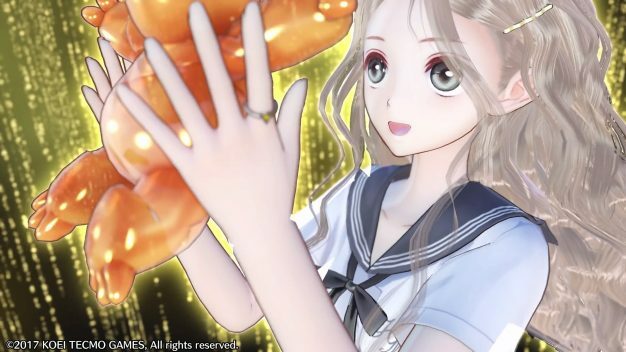 The acquaintance started to repeat herself over and over, gained a weird aura and glassy eyes, and Hinako had to defeat a monster in her section of the Common to obtain a Fragment from the girl’s emotions. Hinako is the only one of the three Reflectors who can crystallize Fragments, which involves tapping into the emotions the victim was feeling at the time and empathizing with them. 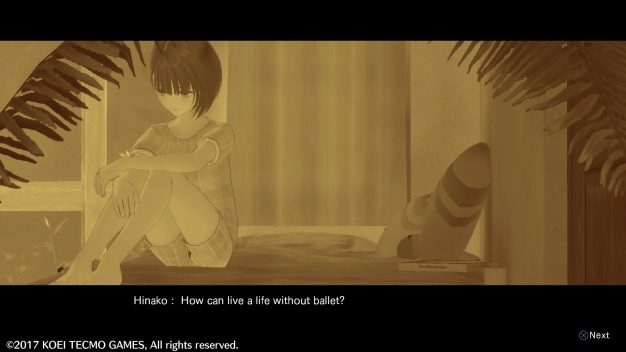 Through empathy and understanding the other character’s point of view, we also see snippets of Hinako’s recent past during her time in rehabilitation and her struggle with comprehending a life without ballet. Crystallizing the Fragment keeps the singularity stable and allows one of the other two Reflectors to create a ring for the rescued girl to wear. Girls with rings can be “summoned” in battle as support characters, and building your friendship with them over time will net equip-able Fragments which give special abilities and buffs. Yuzu and Lime eventually explain that the Reflectors must keep the emotions in their singularity (the area around their school) at normal levels in order to protect against the game’s big bad race – The Sephirot. Hinako is fairly reluctant to participate as a Reflector until she finds out that she can gain a single wish after they are defeated. With her return to ballet in mind, the Reflectors set out to improve their bonds with other girls in the school and save the world from the Sephirot. Phew. Now, while that explanation may seem very involved, the core gameplay of Blue Reflection is very simple. 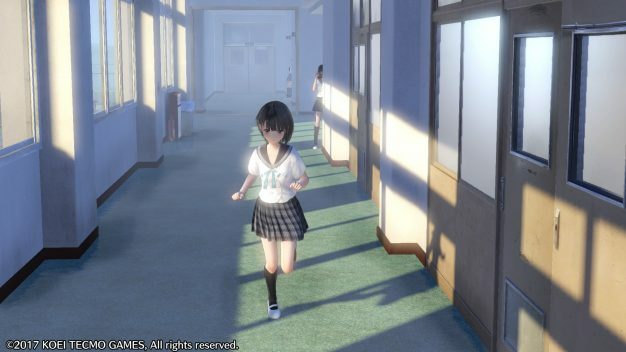 Blue Reflection operates on a day/night cycle. During the day you are at school. You can travel around the school by foot (which is achingly slow) or by fast travel (which I am very grateful for) completing missions. Almost all missions can be categorized into one of two types – befriending classmates after they become relevant to the story, or saving insignificant NPCs in the lobby area of the Common, which generally involves beating X amount of Y enemies and obtaining a fragment. 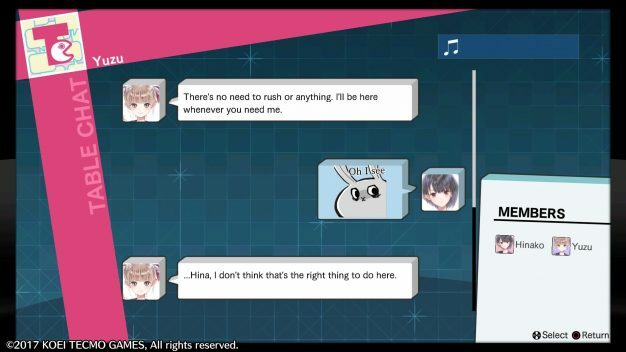 During the day you can also check your phone and use your chat program with other characters at certain times to get some genuinely funny dialogue, or you can go into your monster-raising game and play around with that. At night, Hinako returns home and you get a limited list of things to do, like studying, taking a bath, or just going to sleep. Sometimes these actions have effects in the early hours of the next morning at school (i.e. other Reflectors may get stat bonuses if you chose to study). Once they are available through story progression, interacting with and befriending your classmates becomes vitally important. Once the initial befriending is complete, you can invite your classmate to hang out after school, and by selecting the correct answers you can increase their friendship meter. By befriending and helping more people, you raise the overall rating the group receives (all three Reflectors are part of the committee responsible for the upcoming school festival). By hanging out with friends you can also receive new Fragments (equippable Fragments are basically materia that lock onto specific skills and trigger when the skill is used) and even growth points, which are involved in levelling up the Reflectors. Each Reflector will receive a growth point at semi-regular intervals, either through story progression or friendship events. 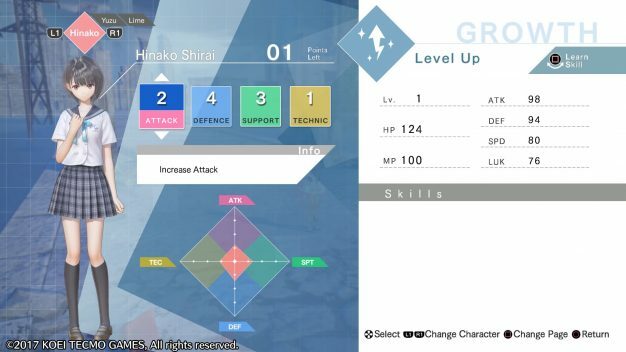 The player can spend growth points on one of four skill areas – Attack, Defense, Support, and “Technic”. As you’ll see in the pictures below, once you have the required number of points in one or multiple skill areas, you will unlock skills. Every time you spend a growth point, you also level up. Sometimes you can unlock more than one skill at a time, which always feels like a little bonus. Battle is turn-based, with a meter at the top of the screen similar to what you’d find in a game like Child of Light. On the left-hand side of the meter, tiny icons representing your Reflectors race to the middle of the metre, while on the other side the icons representing each enemy do the same. When one of the icons reaches the center, it becomes that battler’s turn. Many skills have a Knockback sub-skill, which pushes the enemy (or ally!) back from the middle of the meter. Obviously if you want to get all your hits in before the enemy has a chance, you have to make solid use of Knockback skills. You also have your standard HP/MP bars, but you also have the option to spend a turn recharging your MP using Ether Charge (Ether being MP/the energy needed to do anything if you’re a Reflector). 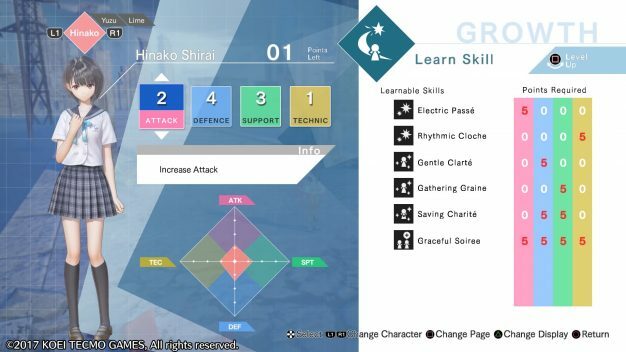 You can also use Overdrive mode, which boosts the relevant character’s skill power but only lets them use each skill once, in whichever order they choose. This means you can quickly brutalize an enemy with three attacks in a row, finishing off with a nice healing move before they even get a chance to move along the meter again. There’s also the supporting character abilities, which can be triggered at certain points during battle and offer a range of skills. So, now that we’ve got all of that out of the way, let’s have a quick chat about how blatantly Persona this is. The notion of having a mostly school-centered Japanese RPG is absolutely nothing new, but the extreme focus on helping other students overcome their personal demons and sort out their emotions, complete with weird eyes and spooky auras? Very Persona 4 and Persona 5. If that’s not enough, going to a general area where all of humanity’s emotions are kept – very much like Mementos in Persona 5. Going to special individual “dungeons” to do the same thing but for story-relevant characters? Also very Persona 4 and Persona 5. And while the Persona games certainly don’t have any copyright on this, having elemental attack options in addition to 2-3 physical attack types (in this case Heart and Pierce) was certainly popularized by the Persona series. Blue Reflection is absolutely a watered down, fan service and magical girl-focused version of Persona 4 and Persona 5, but that doesn’t mean that it lacks its own charm. While in other cases I may leap to attack a game which focuses predominantly on its visuals, I feel like I can’t do that with something that’s part of the “Beautiful Girls Festival” line of games. While I don’t think the character designs are anything too out of the ordinary or special, it’s incredibly clear that the artists went to a great amount of trouble to make a lot of varied (albeit often clichéd) characters. It’s also very clear that they went into great detail with their faces and the subtle differences in their uniforms to make them feel like individuals. While I haven’t picked up an Atelier game since the PS2 era, I have considered picking up one of the newer PS3/PS4 entries from time to time and considered that all the art looks very cutesy and samey. I do still feel this way a bit with Blue Reflection, even though I appreciate how much effort went into the character designs specifically in this title. Unfortunately, the nice character designs are sometimes overshadowed by how weird the model movements are. Game characters have come a long way but many of them still haven’t gotten past that Final Fantasy X era issue of not being able to touch their own heads unless they look like they’re trying to also give their head a wide berth. While they’re nothing super special, the general graphics in this game are very pleasing to the eye. In particular, the Common is really enjoyable to explore and is just pretty. I can’t praise the UI enough, whether day or night, or battle or school time. While it’s nothing Persona 5 level (I promise the comparisons between these games will stop soon), all of the buttons and menus stand out really nicely and each one reacts to you hovering over it (i.e. the items menu is a bag icon with a charm. When you hover over it, the charm waggles back and forth). I’m a sucker for little details like these and the menus and UI in all areas of the game are very aesthetically pleasing and deserve plenty of praise. I really liked the leveling and skill acquisition system in Blue Reflection, even though it all feels a bit chaotic at the start when you’re picking up new skills left and right and unsure about how useful they will be. I liked the element of strategy that goes into carefully selecting which of the Reflectors will specialize in physical, magical, or support skills. While I don’t think it was the game’s intent, I ended up using Lime for a lot of my attack magic, so it appears that the game is fairly versatile in that regard – a white mage is not limited to being a white mage. Battle is fairly standard, but I am a big fan of the meter and knockback mechanics, especially since it took me back to playing Child of Light, and to a lesser extent, Grandia. I think adding systems like these to an otherwise fairly standard turn-based battle system is a fantastic idea and it makes fighting enemies so much more interesting. 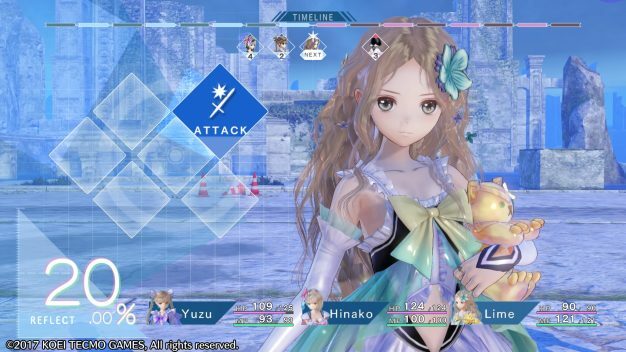 I think the fact that Blue Reflection doesn’t comprise of really long dungeons and forced enemy encounters is definitely a positive, especially considering how chapters fly by really quickly and the game is heavily story and character development focused. While it may feel slightly rushed at the start, Blue Reflection definitely settles into a nice balance of battle and story progression later on which would have otherwise been impeded by having lengthy standard RPG dungeons. Blue Reflection’s soundtrack honestly doesn’t stand out that much because it’s very soft, even in the battle themes. There’s a lot of gentle piano and effective yet reserved use of string instruments like violins. The music isn’t super memorable, barring the main battle theme which I had stuck in my head at work on more than one occasion, but it is appropriate for the game’s atmosphere and used to great effect. While only one of the songs has really stuck with me outside of actual gameplay, it’s a really nice soundtrack created by obviously skilled composers and musicians. 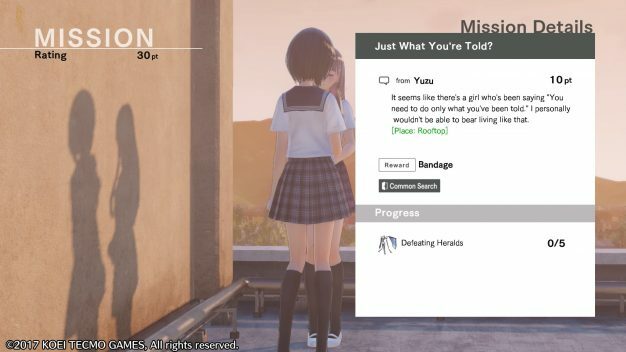 Hooboy, okay, this next bit needed its own review section so it could be allocated its own awful amount of points – the localization/translation in Blue Reflection is absolutely atrocious. The game audio is completely in Japanese and all of the menus and dialogue are subbed in English. Even in the first few chapters there were countless typos, missing spaces, extra words, and at one point Lime is referred to as “Raimu”. I’m not sure if the translation is rushed, but it’s really, really distracting if you’re relying on the English subtitles. As for the story and character interactions themselves, you have to prepare yourself at the beginning for a really poorly-paced, rushed introduction to someone’s emotions going “rampant” (the weird aura and glassy eyes thing) seemingly out of nowhere. You could argue that even normal-looking people and conversations could hide an array of out of control emotions under the surface, it just feels a bit unnatural at first (it does get better later). While I appreciate the instinct to get to the point and to not dawdle on introducing the core parts of the gameplay, Hinako’s first interactions with her middle school acquaintance are poorly handled. My next complaint may actually be more of an audio/visual complaint, but significant story points and the completion of missions while in the Common sometimes seem to get no fanfare. There’s not even a ping to say that you’ve completed a mission (although there is a visual cue) and sometimes there’s awkward patches of silence where characters pause and don’t react as quickly as they should. Normally I would blame this on needing to wait for weird times in between dubbed voice acting from Japanese to English, but since there’s no audio translation I don’t really know what the deal is there. As for the actual story, it’s interesting, but I don’t find the support character stories particularly interesting or even that fleshed-out. I’d much rather see more of the main plot and Hinako’s story, as those are the ones most shrouded in mystery. Oftentimes when I receive a game to review, even if it’s interesting, I seldom go back to finish it. Obviously there are other games to review and just other games I want to play outside of review-writing and these games fall by the wayside and never get picked up again. In the case of Blue Reflection, I fully intend to see it through all the way to the end. It doesn’t appear to be a particularly long game in the grand scheme, and I occasionally enjoy games where battle requirements are kept reasonably light and story and life sim stuff is highly prioritized. Blue Reflection isn’t doing too much new stuff, but if you pick it up you will get yourself a pretty, cute, and fun game with a nice soundtrack and battle system and an exceptionally tasty UI.